The Great Wall is the most famous tourist attraction in China. The length of the Wall is over 5,000 kilometers. The history started more than 2700 years ago when the separate states in China build their own defence walls. In 220 B.C, the emperor Qin Shi Huang joined those walls together to form an united defence system. The Terracotta army in Xian is guarding his mausoleum. The emperors in the Ming Dynasty made the Wall larger. The Great wall is located North of Beijing and has several sections: Badaling, Simatai, Jinshanling, Mutianyu, Gubeikou, Huanghuacheng and Jiankou. 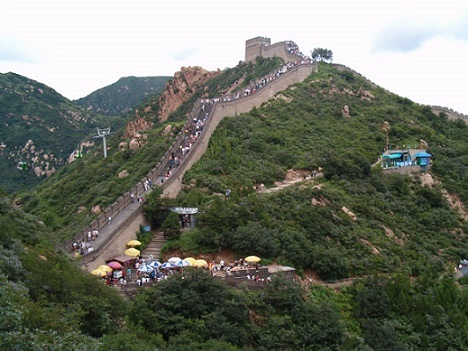 Badaling and Mutianyu are both well preserved and most visited by tourists. Distance is 70 km away from downtown Beijing. If you want to avoid the crowds then you could consider to go to Jinshanling, Simatai or Gubeikou. The sections Huanghuacheng and Jiankou are only suitable for people who likes hiking in nature. Several bus lines are driving to these sections. The pictures on this page are taken in Badaling. This part of the Great Wall is the best preserved. 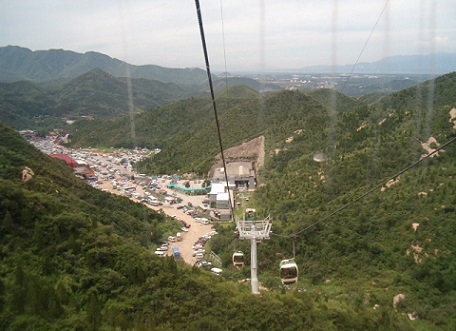 The cable car with a cabin takes you to the top of the hill. A ticket cost 100 Yuan (roundtrip). A second ticket for the Great Wall cost 40 Yuan. On the Wall are many tourists and merchants. 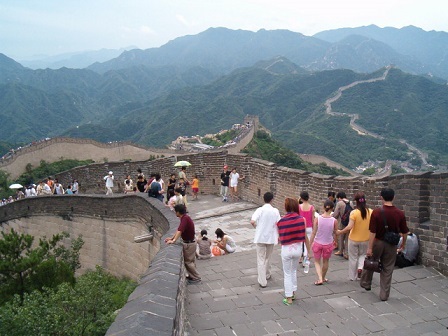 Along the parking lot are restaurants and souvenir shops where you can buy your t-shirt “I climbed the Great Wall”. In allmost all hotels you can book a trip to the Great Wall. Pick-up and return is at the hotel. If you want to go on your own you should take tourist bus 877. A cable car takes visitors to the Wall. On the left is the parking lot.